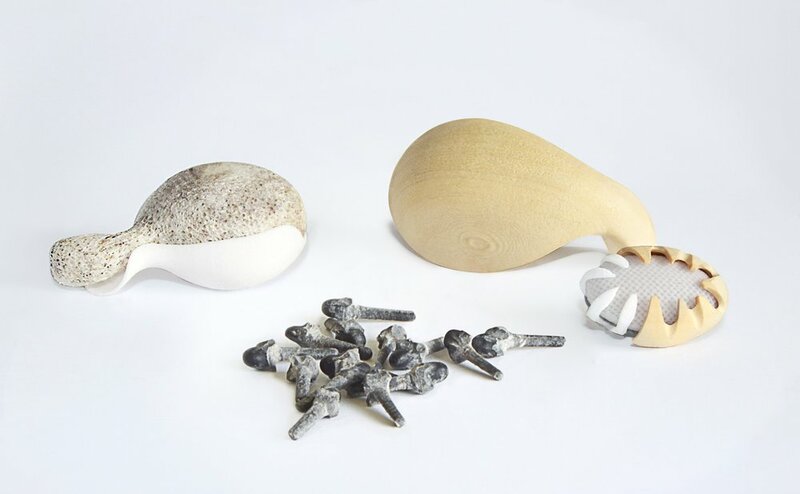 The selected artists were supported by five European institutions working in partnership on the project- funded by Creative Europe - with the aim to explore the relation of 3-D digital fabrication technologies to traditional art, craft and designer-maker processes. Made@eu, is a European project of applied research funded by Creative Europe and supported by five European institutions in partnership: Plymouth College of Art, École Nationale Supérieure de Création Industrielle (ENSCI) Paris, Institut d’Architectura Avancada de Catalunya (IAAC) Barcelona, WAAG Society: Institute for Art Science & Technology in Amsterdam and Fab Lab in Budapest. The aim of the Made@eu project is to investigate issues around the integration of digital fabrication technologies in the creative sectors. As part of this research, the project offered a selection of creative professionals within the art, craft and design fields, the opportunity to take part on a residency program. Material Origin Series, the research project developed within this residency, explores how 3D digital technologies and to processes might integrate with existing analogue methods and workflows. Enlisting the help of luminaries from the world of science, technology and design, Material Alchemy showcases new responses to material innovation and provides key insights into how material will be utilised to shape our future environments. Material Alchemy explores key topics such as synthetic biology, how designers and scientists are designing with living matter utilising the laboratory as a means to cultivate and grow new materials and how new technologies such as 3D printing are revolutionising the manufacturing industry. The event will open on Wednesday 17th with a panel debate about material innovation in Fashion with participation of Pringle´s Creative director Massimo Nicosia, Disegno´s editor Johanna Agerman, MAMF course leader Caroline Till and architect Richard Beckett. The second edition of the 3D Printshow will take place in the French capital on the 17th and 18th of October. Carousel du Louvre 99 Rue de Rivoli, 75001, Paris. Organized by MENA Design Research Centre, the Annual Beirut Design Week will take place across Beirut City between the 24th June and 30th. The event will be launched with the NEWCOMERS exhibition at Atelier NS that will feature a selection of hybrid textiles from the collection `Digicrafted´ combining 3D printed surface design with traditional textile craft. The exhibition will also showcase new work from Amy Congdon´s `Biological Atelier´. Necklace featured in editorial Computational Couture for NZZ Magazine (Switzerland) shoot in Staatliche Museen, Berlin. POSTextiles will be showcasing a selection of material samples for Designers Block at Birmingham Interiors.